FORT GREENE — Dead animals in a Fort Greene butcher shop are being brought back to life — as soap and candles. Greene Grape Provisions' head butcher Lena Diaz doesn't believe any part of an animal should go to waste, so she decided to turn trimmed animal fat into candles and soap to sell at the shop's holiday pop-up market. "One of the biggest hurdles in the meat industry is what to do with all this fat and there is only so much charcuterie and so much sausage that you can make," she said. "So we decided to make candles and soap with our fat — which is the revival of an old-school way to make soap and candles." 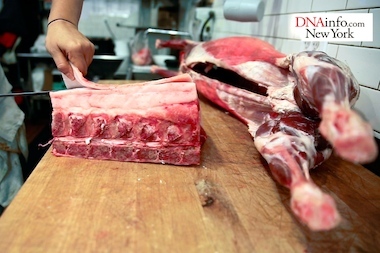 Diaz cuts the fat from animals — primarily hog and steer, but also lamb — and then grinds it. She then cooks the fat, also known as tallow, in a pot on the stove until it liquefies. Staff at the shop later add fragrant oils, such as clove or rosemary, which gives it a pleasant perfume more akin to regular cosmetics scents than cooking. They then pour it into candle or soap molds and leave it to harden. The entire process takes about two weeks. Diaz turns approximately 14 pounds of fat into soap and candles each week. The Fort Greene resident says she uses meat soap herself and stands behind the product. "It feels like soap, it acts like soap," she said. "Although you will have the squeamish person that is grossed out to find out that they are using animal fat to wash their body." Animal candles and soap are available at Greene Grape Provisions (767 Fulton St.) and the Holiday Pop-Up Market (680 Fulton St). The prices vary depending on size.